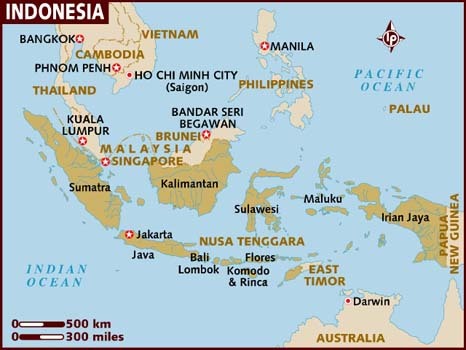 Indonesia is a country of 17,000 islands! Of which we plan on visiting 5…maybe. Bali is the main reason for visiting Indonesia. A small island that, although it has grown in popularity, is still laid back and relaxed. There is Kuta in the south leading to the Bukit Peninsula which houses the luxurious tourist resorts in a manic whirl of activity. It is unlikely we will see much of this part of the island as it will be out of reach of our backpacker budget – but maybe a visit just to see how the other half lives. Lovina is likely more our style. A string of villages along the nothern coast that are laid back, relaxed and low budget. Gazing out to the Indian Ocean from our classic ‘hut on the beach’ with barely a care in the world. Ubud is the artsy, crafty, hippie heart of Bali. I think I will love it as I like it when there is plenty to see and do, but also lots of places to relax and just take it all in. There is also plenty of hiking around Ubud – out into the countryside to see the spectacular views of the rice paddies and temples. And then there is Gunung Batur. A volcano in the center of Bali that must be climbed to catch the first glimpe of the sun at sunrise. I love volcanoes, and the thought of being able to trek around it, and climb up it is exciting – apparently there are even heat vents! Lombok is just to the east of Bali. It is, apparently, even more relaxed and laid back than Bali. There are more volcanoes here to explore, but likely we’ll stay on the western side of the island and primarily use it as a jumping of point to the Gili’s. Gili Air, Gili Meno and Gili Trawangan are a trio of idyllic islands of the north western coast of Lombok. I think this will really be the ‘getting away from it all’ locale. White sand beaches leading to snorkelling off the coral reefs and swimming in the crystal clear water…really, does it get any better than this? 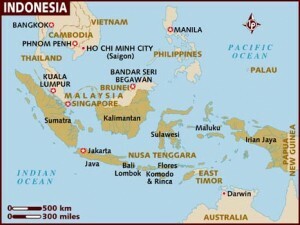 Visiting 5 islands out of the 17,000 hardly allows us to say we’ve visited Indonesia at all. But these 5 will offer all that we are looking for…and may entice us to come back one day and visit more.